There are so many California Zinfandels available at rock-bottom prices these days that it becomes difficult to even distinguish between them. They’re all big, fruity, and to be quite honest: bland and one-note. That is not the case with the 2014 Dry Creek Zinfandel from Dashe Cellars. This Oakland based winery takes a definitive non-industrial approach to winemaking, producing single-vineyard wines of exceptional quality. Many large industrial winemaking operations tweak and manipulate their wines to get it to taste the way they want through artificial means. Michael and Anne Dashe believe in taking a natural approach to winemaking, i.e. you get quality wine from harvesting quality grapes. In the case of their 2014 Dry Creek Zinfandel, the fruit is sourced from several small family-owned vineyards in north and central Sonoma, with grapes from ancient vines nearly 100 years old. 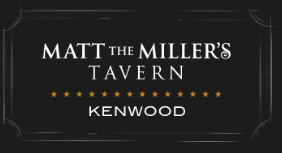 This natural approach includes fermentation using only indigenous yeast, and little to no fining or filtration. This natural approach has produced a very interesting wine, tasting almost like an Italian Primitivo rather than a California Zinfandel. This wine is tart, deep and peppery with a bracing acidity that made my mouth water – in a good way! I tasted tart plum, with a touch of raspberry, bold tannins but no bitterness whatsoever, and an extremely long fruit and pepper finish with some vanilla notes. I did not expect this wine to taste this unique! Robert Parker gave the 2014 Dry Creek Valley Zinfandel 90 points, which definitely got my attention. You can find it at The Party Source for about $27. 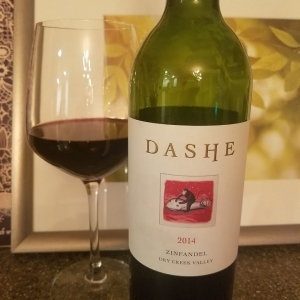 On my five-cork scale based on taste and value, I give the 2014 Dry Creek Valley Zinfandel from Dashe Cellars 3.75 corks! This is a wine that would pair nicely with cheesy pasta and meat sauce, or my favorite, chicken parmesan.